HF: You have made a number of these shorts in your series with different crews on different films. Can you speak to the day to day reality of working with varied crews across time rather than having one set crew for a tightly prescribed production schedule? VL: The relation between the director and the crew is such an important one – film-making is a collaborative endeavour after all and these are the guys with the skills to really bring your vision to life on screen. In some ways, I’d love to be able to work with the same crew every time I go out filming as I think you build up an understanding of each others’ ways of working which gives you a certain creative confidence on the ground. Having said that, it’s also exciting to work with new crew, both camera and sound, as they bring new approaches and ideas to the table that, as a director, you may not have thought of before. It also forces you to clearly articulate your vision of what you’re trying to achieve. 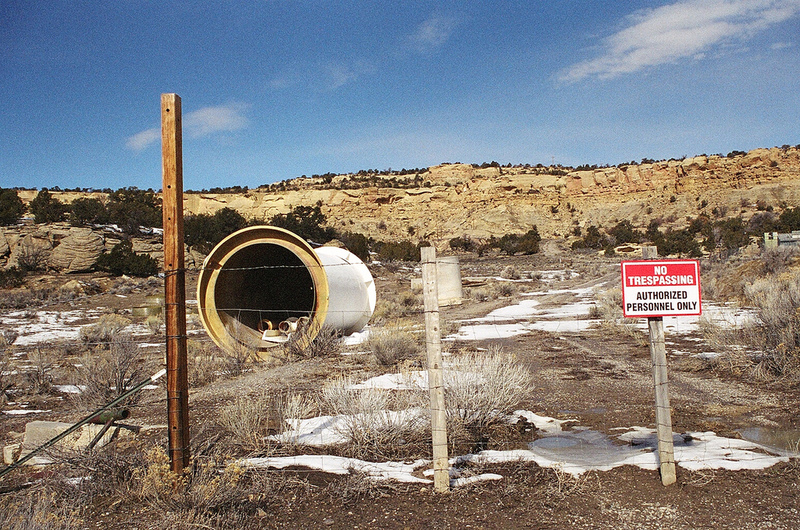 Churchrock Mine located within the Navajo Nation in New Mexico. Photo courtesy of Vicki Lesley. In the real world, there’s often no choice to be made anyway, as good DOPs and sound recordists are always in demand and there’s no guarantee they’ll be available when you’re in a position to start filming. On a project with one set of returning characters and an ongoing single narrative, that might be more difficult, but fortunately, my film is by its very nature fragmentary and formed of lots of different styles. So in many ways, working with different people has been an advantage more than a hindrance. I hope it’s brought a creative vibrancy to the film, with fresh perspectives behind the camera as well as in front of it. HF: How have your donation link on your film’s website and the IndieGoGo campaign worked out in terms of funding for this series of films? VL: To date, I’ve raised over £5000 (approx $8000) through donations via my own website and IndieGoGo. People have definitely responded to the idea of donating a small amount to the film and thereby becoming a part of a bigger community with a genuine investment in the project. Using Paypal as the means of doing that has worked very well. HF: What role has social media, specifically Facebook and Twitter, played in terms of finding an audience for this series? 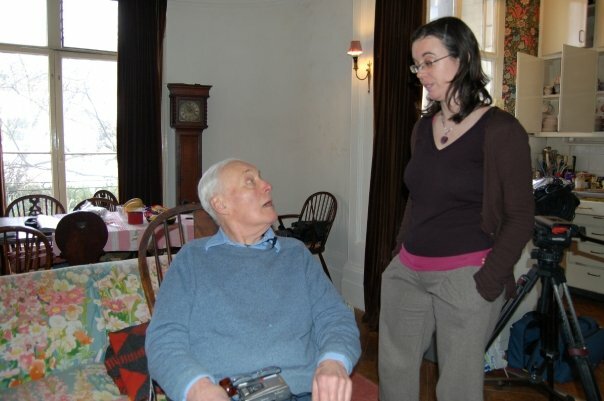 Vicki Lesley on a shoot with Tony Benn, a British Labour Party politician & President of the Stop the War Coalition. Photo courtesy of Vicki Lesley. VL: Social media is playing an ever-greater role in reaching out to our audience for this film. We have around 400 people on the main Tenner Films mailing list but almost another 500 again following the project either via our Facebook group or on Twitter. I have a print out about Barack Obama’s incredible online election campaign pinned up on my desk to inspire me – community-building online is surely the future for so many endeavours, documentary films included. I’ve got quite a way to go to match Obama admittedly, but we’ve all got to start somewhere! HF: What is your plan for distribution? I see this film very much in the tradition of other social-action feature documentaries (Black Gold, The End of the Line, An Inconvenient Truth) and have similar distribution aims. Ideally, a limited theatrical release followed by a broadcast television screening and then a DVD release. I’m also very interested in putting together some sort of “community-screenings” package, much like that used by the team behind The Age of Stupid, so that people in communities where nuclear power is a real, live issue, can organise local events around the film. I’m currently talking to producers/distributors with experience of rolling out these kinds of films who can help me achieve these plans, as well as a number of outreach partners interested in building a bigger movement around the film. HF: What role in society do you find or see yourself playing as a filmmaker – storyteller, revealer of truths, issuer of calls to action, or something else altogether? VL: Hmm, that’s a good question! Hopefully all of the above, but more than anything I guess I would say I aim to be a chronicler of real human experiences you may not have heard elsewhere. HF: If you could give one piece of advice to an aspiring or beginning woman filmmaker, what would it be? VL: Never be afraid to ask other people for help. Lesley’s short film Fifty Years will be screened at the Document Human Rights Film Festival to be held in October 2010, in Glasgow, Scotland. Check out Vicki Lesley’s filmography on IMDb.com. Join the Facebook page for 13 Short Films about Atomic Power. Follow the news about atomic power and Tenner Films on twitter @tennerfilms. Visit and peruse the extensive Tenner Films website and watch some videos. Check out Vicki Lesley’s channel on YouTube. Join the MySpace page for Lesley’s films. Vicki Lesley hosted the “Grassroots Film Funding Workshop and Tenner Film Shorts” at the Leeds International Film Festival last year. Read an article in The Guardian by Vicki Lesley on tips for the lazy environmentalist. Read a piece (“The Futureproofers”) co-authored by Vicki Lesley at Green Futures. A big thank you to Vicki Lesley for conducting this extensive interview via email. This entry was posted in women filmmakers by kynamorgan. Bookmark the permalink.